Angelino Media LLC was behind several industry-disrupting projects at the time, including Beam and Redeem and CompuCast Technologies. 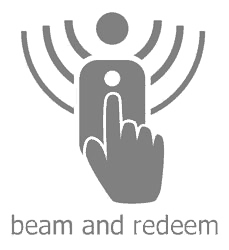 Beam and Redeem is a transparent immersive service using the latest interactive audio technology to communicate with viewers / consumers. At the beginning of each broadcast viewers will be notified that shows are B&R enabled. A logo-screen bug simular to and familiar as a HD, SAP or CC logo will appear on the lower left corner of their TV. Synchronized and on que, an offer from the advertiser will seamlessly appear on the viewer‘s smart device notifying them of a survey or digital coupon for a product or service. These digital coupons will reward the viewer with a redeemable coupon for doctors, beauty service providers, manufactures and other various advertisers. Once the content is encoded with the B&R technology it will be active across multiple platforms via the Internet. A growing number of iPhone / Android smart phone and tablet-enabled consumers (54%) are interested in using their tablets for fairly standard video-on-demand and catch-up functions. 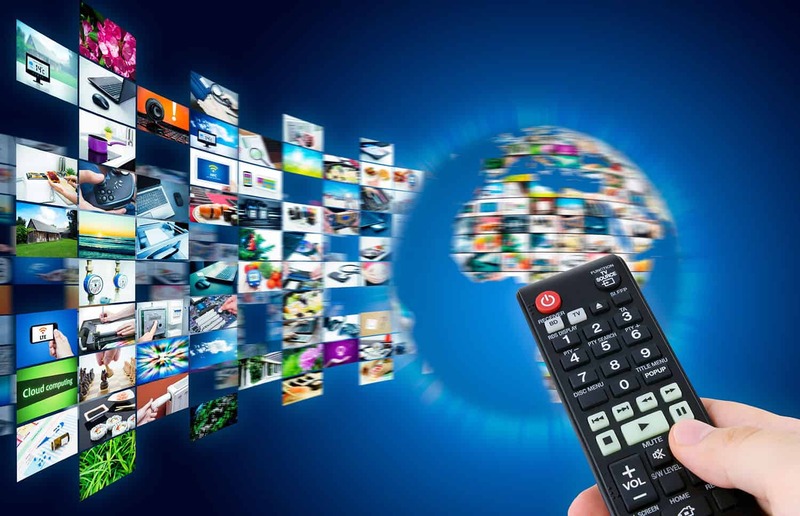 Although 44% of tablet users are interested in the ability to interact with on-air programming to receive additional content related to what they are viewing, according to the report – findings by Accenture which bode well for technology providers keen to advance the case for multiscreen experiences. 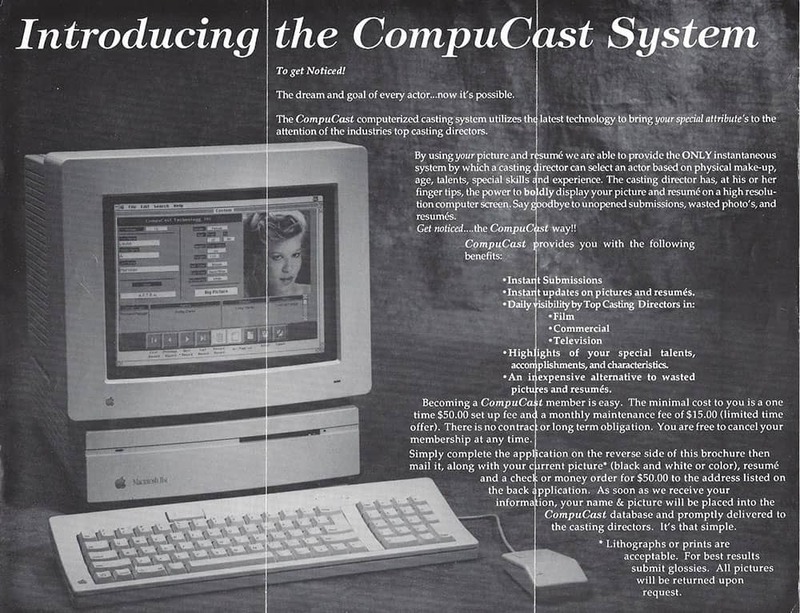 CompuCast Technologies, as seen in this pre-internet photo, used this early Apple relational database system developed in 1990 as an automated casting system for actors. 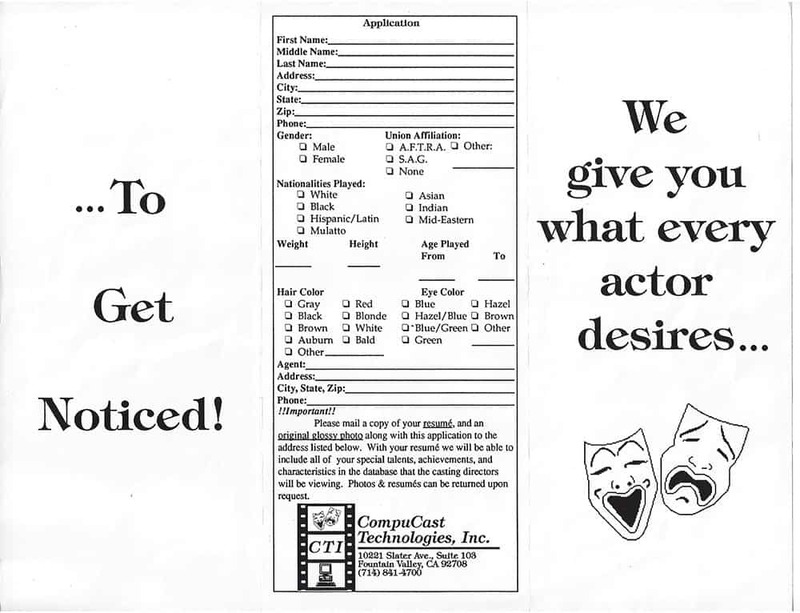 CompuCast Technologies was the first company to eliminate paper for the casting process in Hollywood. CompuCast was later sold in 1993 and the photo relational software was used for the real estate industry.